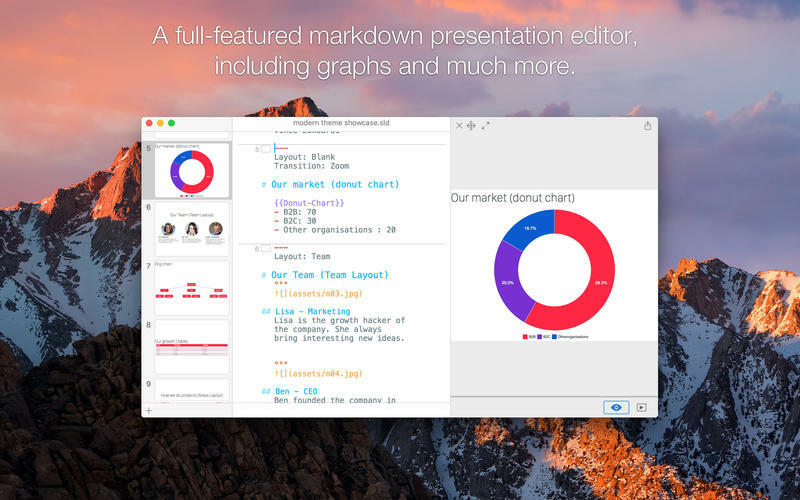 Slidium 1.0.2, an important update to the popular full-featured presentation tool for macOS. Slidium is the easiest way to create beautiful presentation slides from Markdown, including graphs and diagrams -- AND can be used by Markdown experts or beginners. Comes with everything you need - Slidium comes with a set of professional themes and layouts designed to fit with all situations. Custom themes can also be developed using standard web technologies. Unlike traditional markdown editors, Slidium can create all the major types of graphs (bar chart, donut, line chart), mind-maps and org-charts directly in Markdown, without requiring any third party application. Slidium is packed with dozens of vector shapes to illustrate your slides. No more need to waste time to search and download icons. Built for productivity and ease of use - Slidium has been designed for the ease of use and with productivity in mind. Final result can be visualized directly with the real time preview. If you're learning Markdown or you prefer a more conventional interface, Slidium adapts to you and let you use its visual formatting options. Slidium provides an intelligent completion list allowing you to quickly select themes, layout, or vector shapes. Slidium 1.0.2 is available for the price of $39.99 (USD), exclusively through the Mac App Store in the Productivity category. Promo codes are available to members of the press. For more information, please contact Ric Perdereau. Lyon, France - Founded in 2009, Neomobili is an independent software company based in Lyon, France. Neomobili develops innovative apps with design and simplicity in mind. We specialize in markdown editors. Our philosophy is to provide attractive, efficient and innovative applications which will give you fun while saving your time. Copyright (C) 2017 Neomobili. All Rights Reserved. Apple, the Apple logo, macOS and Macintosh are registered trademarks of Apple Inc. in the U.S. and/or other countries. Other trademarks and registered trademarks may be the property of their respective owners. If you're learning Markdown or you prefer a more conventional interface, Slidium adapts to you and let you use its visual formatting options.